Ford's U.S. sales decreased an estimated 5.2% in March with a 1.6% year-to-date drop in the first quarter of 2019. Despite the year-over-year volume drop, Ford is selling the right sales mix as the F-Series outsold its nearest competitor by nearly 95K vehicles. This mix is driving top-line growth as fourth-quarter 2019 showed a quarterly revenue increase of 1% up to $41.8 billion from the same quarter in 2018. While cash is expected to tighten due to restructuring costs, management is committed to the dividend and the changes will better position the company for the long term. Ford (NYSE:F) posted better-than-expected quarterly sales in the first quarter of 2019 with U.S. sales decreasing 1.6% from the same quarter in 2018. This decrease was much smaller than other large domestic competitors. Despite this decrease, consumer preference continues to shift to larger automobiles due to lower gas prices and an improving economy. This sales mix is driving higher margin sales which was evident in the 2018 earnings release where revenue increased 2% compared to 2017. Despite the revenue increase, the company saw a reduction in net income due to various headwinds, including Asia/Europe sales, supply chain disruption, and higher commodity costs. Management is putting restructuring plans in place, which is expected to make cash flow tight over the next few years; however, I believe management is committed to paying the current dividend, and the short-term pains during the restructuring will be worth the changes made to the organization. With a below-industry-average P/E, near 7% forward dividend yield, and strengthening core business, I continue to recommend Ford as a buy for the value buy-and-hold investor. In March 2019, Ford’s U.S. sales fell 5.2% to 221K units which capped a slow first quarter of the year where sales fell 1.6% compared to last year’s first quarter. The quarterly decrease was fueled by 23.7% decrease in car sales as consumers continue to transition to larger vehicles. The industry as a whole saw a slow start to the year with U.S. sales dropping 3.2% through March. The decrease in sales is being attributed to higher interest rates and rising new-vehicle prices as the industry is no longer seeing the benefits of 2018’s tax cut and the overall economy is slowing. While conditions are expected to improve along with the spring weather, analysts are forecasting that U.S. sales will drop below 17 million new vehicles sold for the first time since 2014. Other automakers posting year-over-year decreases in March include Fiat (FCAU) down 7.3%, Toyota (TM) down 3.5%, General Motors (GM) down 8.3%, and Nissan (OTCPK:OTCPK:NSANY) down 5.3%. While the industry down, Honda (HMC) up 4.1%, Hyundai (OTCMKTS:OTCPK:HYMTF) up 1.7%, Volkswagen up 14%, Kia up 10% and Subaru (OTCPK:OTCPK:FUJHY) up 6%, were able to buck the downward trend. Despite the drop in volume, the automakers are still expecting a profitable 2019 due to the ongoing consumer sentiment shift to higher margin vehicles. The automakers are benefiting from this shift to crossovers, SUVs, and pickup trucks as consumers are abandoning passenger cars, which works favorably for Ford who relies heavily on the success of its F-Series pickup truck. Passenger cars are falling fast and now only make up approximately 30% of new car sales, which is well below prior averages where cars once made up over half (43% in 2015). This trend is expected to continue in 2019 where 1 in 2 vehicles sold will be SUVs or crossovers. With this trend, the volume is clearly going to suffer but it’s allowing automakers to take advantage of the higher gross margin vehicles and pad their bottom lines. For the industry, the estimated average transaction price was up to $36,733 during the month according to Kelly Blue Book. This was a 2.83% or $845 per vehicle increase from March 2018. Ford has been able to increase its average transaction price led by the F-Series. Ford’s F-Series ended the 1st quarter with an average transaction price of $47,454 as customers are opting for higher trim and more technology embedded. Furthermore, F-Series incentive spending in the first quarter was lowest among all major full-size pickups. With this increase in transaction price and the increase in the borrowing rate, it’s clear why volume is dropping for the automakers. Interest rates have hit their highest level in 10-years with the average rate being charged of 6.3%. These two metrics are increasing the monthly payment for consumers which is preventing them from being able to afford new vehicles. 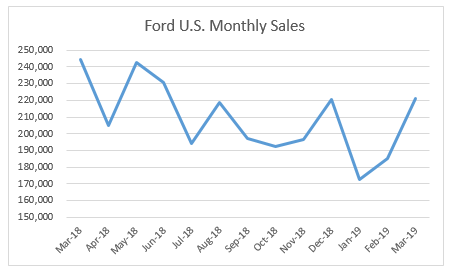 For Ford, see the below chart showing the monthly U.S. sales for the trailing 13 months. Ford’s average monthly quantity sold in the first quarter has been 197K which is trailing last year’s first quarter monthly average of 200K. Source: Image created by author with data from monthly Ford press releases on the company's website, Bloomberg, and AutoNews reports since the company stopped reporting monthly results. In the full year 2018, Ford’s Car segment saw an -18.4% decrease from 2017. The segment is off to an even slower pace to start 2019 with 1st quarter sales decreasing 23.7%. On the other hand, larger vehicles such as SUVs and trucks saw increases of 0.5% and 1.4% in 2018 versus increases of 5% and 4.1% to start 2019. In total, the quantity was down 3.5% in 2018 vs. only down 1.6% in the first quarter. Despite this decrease in quantity, the company was still able to increase revenue by 2% in 2018. This is a favorable shift for Ford largely due to the success of the F-150 and SUV segment which has helped drive Ford’s transaction price higher. It shows that the company has the right mix of cars to take advantage of the consumer shift to larger vehicles. Given 1st quarter sales numbers, I anticipate this trend to continue when Ford releases 1st quarter financials later this month. Ford's success is coming as a result of the success of the F-Series, Expedition, EcoSport, and Lincoln Navigator. Full-year F-Series sales were up 1.4% in 2018 with just over 909K trucks sold. Ford is hoping to improve on this number in 2019; however, F-Series sales totaled 215K in the first quarter which was only a 0.2% increase from 1st quarter of 2018. The F-Series continues to be America’s bestselling pickup with a leadership position of nearly 95K pickups. addition to quantity, transaction prices are running at record levels. This is largely due to customers moving away from the base model and selecting crew cabs and higher-trimmed vehicles. Other large vehicle brands are taking advantage of the shift, including the Navigator, Expedition, and EcoSport, which provide Ford with competitive SUV options that are driving sales numbers and profitability. 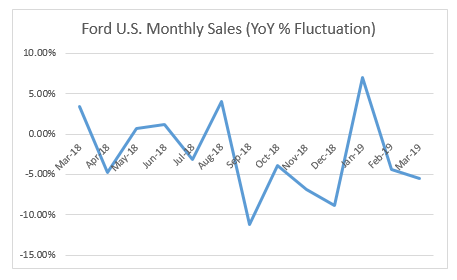 See the below chart showing the monthly U.S. sales fluctuations for Ford compared to the same month a year ago. Ford has spent 8 of the past 13 months with volume declining from the same month a year ago as consumers move to more expensive vehicles. Source: Image created by author with data from monthly Ford press releases on the company's website and Bloomberg reports. When Ford reported fourth quarter 2018 earnings, revenue of $41.8 billion was able to surpass estimates, while Non-GAAP earnings per share of 30 cents disappointed. As seen by the monthly results, the company was able to drive a revenue increase of 1% in the quarter as a result of the sales mix. This was primarily seen in North America where consumers are buying higher margin vehicles and high-end trim levels. While North America is strong, management acknowledged struggles in China and Europe. In Asia, the company is focusing on improving local management, cost reductions, and localizing more product in China. Additionally, the company is refreshing 60% of its lineup over the next year in efforts to turn around the business segment. In Europe, Ford is going to focus on the Ranger. The company is going to allocate resources to this product while focusing on cost reductions. The turnarounds in these regions are key for Ford to unlock shareholder value, as both regions posted deterioration in 2018. Management is set to release 1st quarter 2019 financial results in late April which will provide a key update on top line growth and whether or not it is trickling to the bottom line at a more healthy rate. While Ford posted growing revenue in 2018, the company is positioned to have a good 2019. This will be done by continuing to sell higher-margin vehicles (F-Series trucks, Explorer, Edge, and Expedition) and adding to the average transaction price while cutting costs. Ford has been able to improve on the average transaction price. Based on first quarter transaction date, it appears Ford has been able to do this as Truck and SUV sales were up 4.1% and 5%, respectively, from a year ago. It's only going to get more difficult, as the industry is expecting to face pressure in the fourth quarter of 2018 and beyond. The pressure is a result of increasing interest rates, less built-up demand, and an abundance of used vehicles on the market. This means the pie is likely to get smaller in the U.S. market, which could erode not only Ford's sales but also its impressive transaction gains as competitors utilize higher incentives to attract business. Given the company's ability to sell SUVs and trucks, I think it is in a good position to compete in a tightening marketplace, but it must make strides in other markets to grow value. In response to the consumer sentiment toward large vehicles, Ford has announced that it would discontinue the Fusion, Taurus, and Fiesta cars within the next few years. Ford wasn't the only automaker to respond this way, with General Motors planning to reduce production on the Cruze compact car and considering stopping production on the Impala and Sonic sedans. As we saw with the Great Recession, consumer sentiment can shift at any moment, and with rising fuel prices, Ford shouldn't completely abandon fuel-efficient cars from its portfolio. However, with SUVs and trucks becoming more fuel-efficient, this hopefully won't be an issue. As evidenced by the earnings release, Ford, as well as other domestic auto manufacturers, are seeing uncertainty around tariffs. Given the current administration's proposed tariffs on steel at 25% and aluminum at 10%, it is likely to result in higher commodity prices for Ford despite the company using mostly American steel manufacturers. During the second quarter, the company estimated that the tariffs had a $300 million impact - there wasn’t a discussion in the 3rd quarter on the impact. Experts are estimating that this could have a $1 billion cost impact on Ford, which is approximately 12% of the company's profit in 2017. However, there is still a lot to be figured out, as the administration is also considering ways to require imported cars to meet stricter environmental standards when entering the U.S. in order to protect domestic automakers. Additionally, there appears to be optimism regarding an imminent U.S. and China trade deal. After a sluggish month, the stock increased in value to approximately $9.45 per share, up slightly from $8.79 a month earlier. At this level, the Price-to-Earnings Ratio (P/E) of approximately 10.3 appears to be fairly valued compared with other key competitors including GM at 7.1, Toyota at 9.2, and Fiat at 6.4. However, it makes sense that Ford would be at a slightly higher PE valuation than other automaker competitors given 2018’s success and predicted 2019 success due to the shift to higher margin vehicles. It appears that Ford’s stock is finally alleviating the pressure the stock has seen since being downgraded by Moody’s last quarter as the company’s dividend was under the microscope. Moody’s downgraded Ford to just above junk status citing its believed negative outlook for the automaker. More specifically, they cited weakening margins in North America and continued difficulties in Europe and China. However, during the month, Morgan Stanley released a report concluding that Ford’s large-scale restructuring could result in the company shedding 25K jobs, as much as GM did later this month. While this restructuring will help Ford in the long run, it’s going to require upfront investment. Analysts are projecting a cash-related impact of $7 billion forecast over the next 3-5 years, which will cause cash flow issues for the company in 2019 and beyond. After reporting Q1 2019 sales, Morgan Stanley described Ford’s results as “piecemeal progress”. Despite this, I still don’t see this impacting the sacred dividend. In 2018, the company paid out dividends of nearly $3 billion (up from $2.6 billion in 2017), while it generated nearly $15 billion in operating cash (down from $18 billion in 2017). Additionally, it had nearly $17 billion cash (down from nearly $19 billion in 2017) to continue funding the dividend, capital investments, and restructuring costs. Management has discussed the dividend during the previous 3 earnings calls to provide additional comfort to investors. It's important to highlight that we believe we can fund these cash effects without impinging on our other capital outlays including investments for growth and our regular dividend. You'll note that all of the metrics for the quarter were lower than a year ago. These declines were primarily driven by a lower volume of high margin products in our North America business due to production disruptions caused by Meridian, along with performance issues in our China operations. And we want to emphasize that we don't know how we've lost control of the way that's been projected, but we've been consistent saying that we plan to pay the regular dividend in this five-year plan. We expect to be able to fund all of our business needs, including the regular dividend but we have to prove that. Ford recently declared a $0.15/share dividend which was in line with the previous dividend. This represents a 6.45% forward yield and is showing management’s commitment to the dividend. Also, I antiicpate management providing an update during the earnings call. While sales volume decreased in the first quarter of 2019 and Q4 2018 earnings were mixed, there is no change in my investment thesis for the month. As evidenced by the 4th quarter financial results, Ford is selling fewer vehicles but it's selling higher margin vehicles which are driving profits and revenue despite increasing costs. Given the low valuation and the company's forward dividend yield of near 7%, I believe the stock is attractive at current prices. While domestic auto sales are expected to decrease before settling, Ford is perfectly positioned to continue pushing higher profit margin vehicles with its larger vehicle offering, including the F-Series, Edge, Flex, and Explorer. Additionally, it is focusing on China and autonomous vehicle-driving technology. I'm excited about the company's future, and I recommend owning the stock with a long-term view. With consumers purchasing more expensive vehicles, it will allow the company to report a stronger top-line and bottom-line growth going forward. Furthermore, I believe Ford has a strong product mix to take advantage of the growing market and will pay investors a near 7% forward dividend yield to own the stock. Company management is committed to paying the current dividend, and Ford should be able to generate the cash flow from operations to continue funding it. While I do expect some short-term pressure as the company restructures to become a more lean company, I think it will come out in better shape on the other side. However, I will continue to monitor how sales are performing in Europe and Asia along with the cash position; with that said, the success in the U.S. makes this stock a stable value investment. Disclosure: I am/we are long F. I wrote this article myself, and it expresses my own opinions. I am not receiving compensation for it (other than from Seeking Alpha). I have no business relationship with any company whose stock is mentioned in this article.